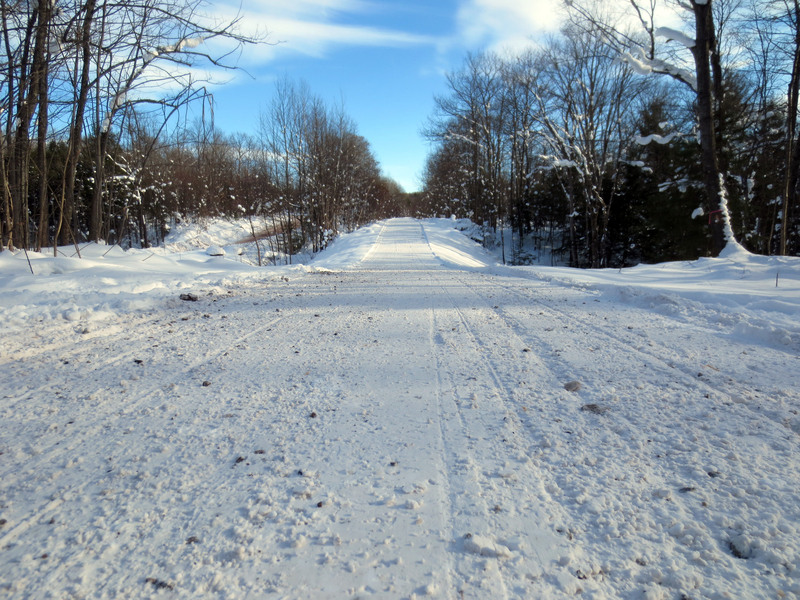 The sounds of heavy equipment rumbled through the woodlands west of Rockland recently in northwestern Ontonagon County. Workers from Jake’s Excavating and Landscaping, LLC in Ironwood were beginning a project to replace a failing culvert over Davy Creek on the old Rockland to Ontonagon railroad route. Once railroad trains pulled their cars over this route, from Houghton County past Rousseau, McKeever and Rockland before rolling through these northern hardwoods, heading north to Ontonagon. Today, the railroad tracks have been removed and the 12-mile route between Rockland and Ontonagon is being reused as a multi-use recreational trail. The work site was positioned not far off Cemetery Road and the Rockland Trail. 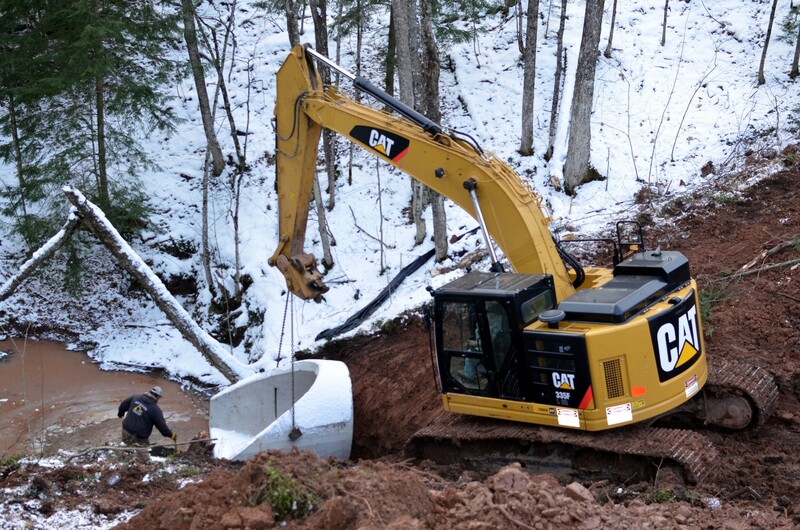 In most cases, replacing a culvert is routine work, but this job was bigger than average. 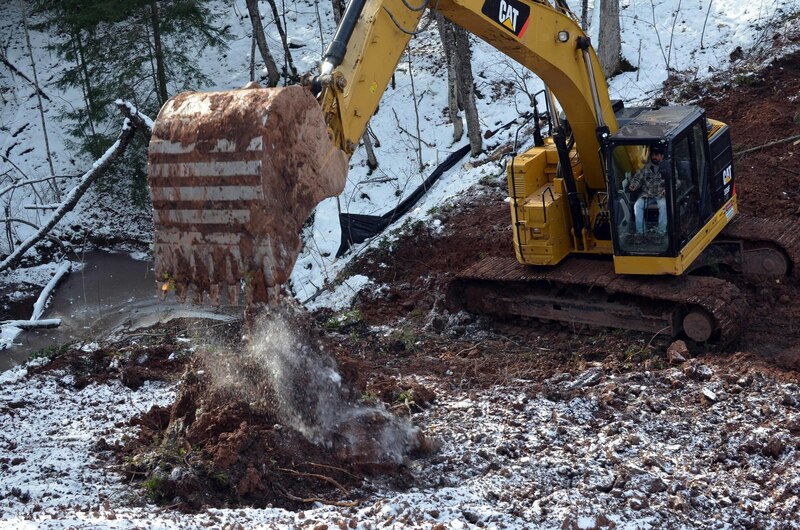 Work crews had to remove a few trees, clay, fill dirt and debris to get to the culvert. The 4-foot-diameter culvert was cracked in several places, filled with wood, rock and other obstructions and positioned about 40 feet below the level grade of the trail. OHM Advisors, from Hancock, did the engineering design and performed the engineering services for the job. Work crews would replace the old culvert with about one dozen 15,000-pound, concrete sections of 6-foot-diameter pipe, which needed to be jointed together mechanically during the installation. The new concrete piping was manufactured at the Upper Peninsula Concrete Pipe Co. in Escanaba. The late-season work was complicated first by unseasonably warm temperatures and rain showers – which surged the flow into the damaged culvert – followed by ice-cold temperatures, gusting winds and snow. Breakdowns of a rented off-road dump truck slowed the dig to the culvert and the creek. Dropping the bucket off the end of a backhoe, the operator hooked sections of the old and new culverts, moving them from and to the creek. With the recent wet weather, the tracks of the backhoe slipped on the steep, clay hillside. Watch a video showing some of the culvert project work. After the first piece of the new culvert was dropped into place on top of some gravel, at the downstream side of the crossing, the remaining culvert sections were brought in one by one. It took several days to complete the work, with additional challenges posed by clay soils and runoff from rain and snow after the sections of the culvert were put in place. The Michigan Trails and Recreation Alliance of Land and the Environment (MI-TRALE), which sponsors this section of trail and coordinated the $107,190 project, is an alliance of multiple trail and outdoor recreation enthusiasts. Funding for the work came from DNR off-road vehicle trail permit fees. With nearly 600 miles of all-terrain vehicle, off-road vehicle, multi-use or equestrian trails in the western Upper Peninsula, MI-TRALE works to advance safe and responsible use of multi-use trails by working toward development, designation and interconnection of these trails in the western U.P. Schulz said without this project, the Ontonagon-Rockland Route would be closed. MI-TRALE President Don Helsel said this project is a great example of ORV license fees being returned to trails to help ensure a safe and fun-filled ride for users. Kakuk praised MI-TRALE and other DNR trail partners. Check out a previous Showcasing the DNR story on the importance of trail club partners. Helsel said the DNR continues to expand ORV and multi-use trail opportunities across the region, with the goal of eventually connecting the east and west ends of the peninsula. For more information on trails in Michigan visit www.michigan.gov/dnrtrails. /Note to editors: Contact: John Pepin 906-226-1352. Accompanying photos are available below for download and media use. Suggested captions follow. Credit: Michigan Department of Natural Resources, unless otherwise noted. For this story, the photos are in chronological order to reflect the progression of the project. 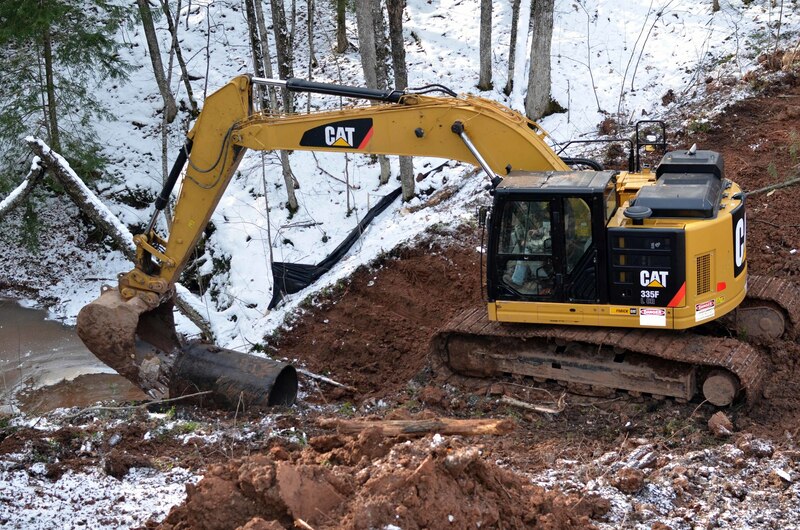 Culvert-2: A backhoe operator lifts trees up-slope from the culvert. 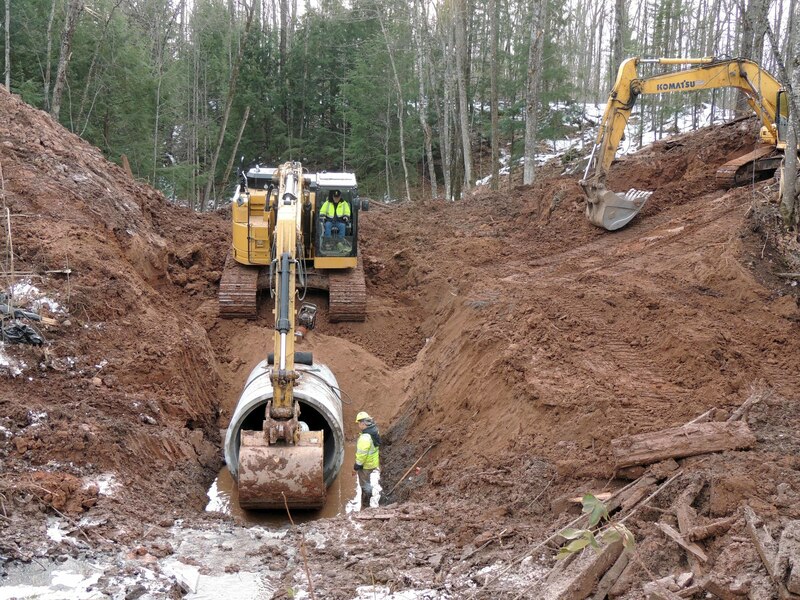 Culvert-5: The first section of the old culvert is removed. Culvert-6: Two of the old culvert sections sit in front of the larger replacement sections. Culvert-7: A worker smooths gravel that will lie underneath the first new culvert section, which will be placed on the downstream side of the trail. Culvert-8: Workers position the first of a dozen sections of new culvert.